So, it’s a bit late, but I thought I’d better finish off the review. Ease of plotting a route. For mountain bikers a big selling point is the ability to go out & explore, then plot a route back home from wherever you happen to be. This is great for MTBers as you can cover more ground on a bike & exploring will get you ‘lost’ more quickly than on foot. A major plus for bikers is the replaceable screen cover. There’s a fair bit of peace of mind knowing that if it gets scratched a replacement is cheap & available. I only used the unit in the dry, but someone who owns a unit told me that in the wet, moisture gets behind the cover making the display harder to read, so maybe some better sealing might be needed? The unit has a tough feel to it which is big plus for MTBers. The main negative I found is the battery level display. It shows as maximum for ages, but when the batteries run out there’s very little warning. A rechargeable is available and comes as standard if you buy the MTB kit. As far as I know the screen on the unit is good in comparison to others, but I still found the display hard to read in sunlight. This is the case with most GPS units but one of Satmap’s selling points was that it was easy to read in sunlight. Once or twice the map didn’t orientate correctly. On one route it caused a wrong turn. I didn’t find the menu system that intuitive – although I got used to it. I guess that’s just me admitting I don’t like to read instruction manuals! A minor was the bulk of the unit. It would be nice if any future versions were smaller or thinner. Crashes are inevitable at some point when mountain biking, and it’s not always possible to mount the unit in a way that would avoid damage in a fall. For some bikes maybe putting it on the top tube would work. Personally I could see the attraction, but I actually quite enjoy map reading & I like to keep the skills up to scratch so I’ll stick mainly with paper maps. 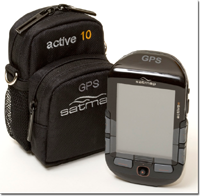 However a GPS unit is great for new routes where time is tight & you can’t afford to retrace your steps. They give you a definite position with no workings out. If you’re after a GPS with OS Maps I’d say this is a good one to go for, some of the other similar models from other brands have some major disadvantages like no option to change batteries so if the rechargeable one runs out you’re stuck. Many just have to many dissatisfied owner reviews on the net. This entry was posted in GPS Units, MTB-accessories and tagged GPS with OS Mapping, mtb, Satmap, Satmap Active 10 on August 17, 2010 by steve. Battery power seems to be easily good for a day & a bit – so far hasn’t lasted 2 whole days with high capacity alkalines. If I owned the unit I’d go for the rechargeable battery (you can always keep AA’s as backup). As with any device with a backlit LCD screen, the brighter the default setting the shorter the battery life. Also the longer the screen stays on before sleep the more battery drain …obvious to some, not so obvious to others. So far I’ve left the screen on a mid setting & about 30 seconds until the screen switches off. In bright sunlight the map is quite hard to read, but the waypoint pointer is much easier. As far as I can gather this is the same with all brands. One thing I need to have a play with is the speed setting at which the compass switches modes. Sometimes at slow speeds, like on a steeper climb, the map flips 180 degrees or the waypoint goes a bit random. This can be a bit of a pain sometimes & send you the wrong way, but not for long. Still annoying though if you end up having to double back & it’s uphill… I have a feeling that altering the afore-mentioned mode change speed might sort this. To me the unit is useful as a ‘get you home’ device. If I want to explore randomly, I can then switch the unit on to plot a route back. 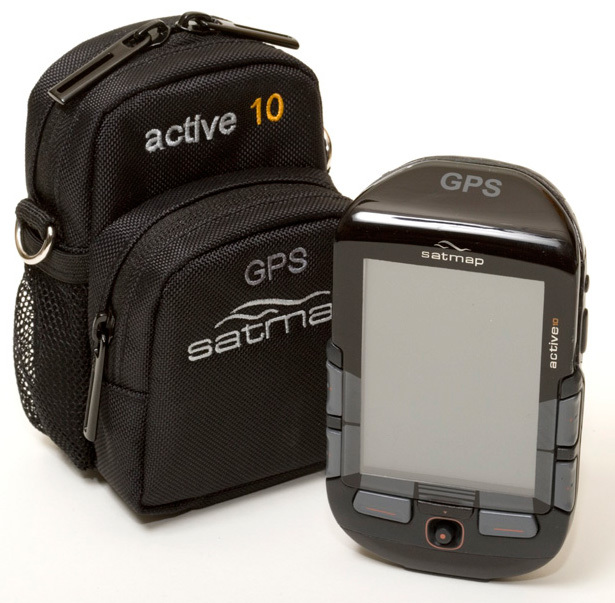 The route maker is easy to use & by all accounts the Satmap Active 10 is the only current unit with a decent one. For a pre-planned route I still prefer to use a traditional map although I may be in the minority soon! That’s all for now, more later. This entry was posted in MTB kit, MTB-accessories, natural trails, outdoor stuff, UK manufactured and tagged gps, mtb, Ordnance Survey Maps, OS Mapping, Satmap, Satmap Active 10 on June 5, 2010 by steve.